Hi everyone! 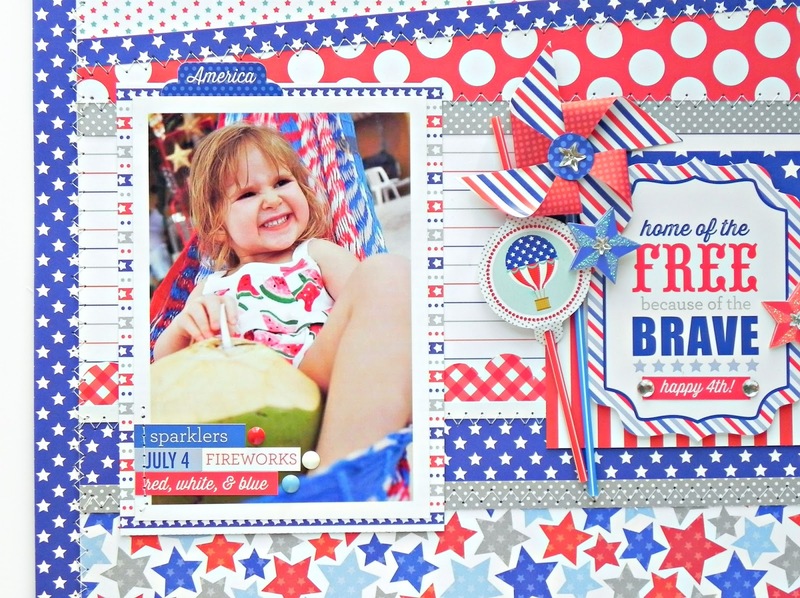 Stephanie here to share my layout made with the new Patriotic Picnic collection. This was a fun one to play with, I like when there are lots of different collection bits and pieces to to choose from and this one has a ton! My little embellishing heart was very happy making this. For this layout I decided to scrap a picture of my little niece, she looks so happy sitting there in that hammock and I can't wait to add this layout to her keep sake book. I decided to do an angled design on top and keep the bottom Straight. I really had fun layering in so many different patterns on this one. At first I was afraid that it would be a little busy so I kept the rest of the layout very clean. I added in lots of stitching and couldn't wait to use one of the Mini Pinwheels and Pixies. I used some of the Pixie Straws to anchor them down and some Mini Doodle-Pops to give it a little something extra. If you're a scrapper who likes to make sure all your patriotic holiday are in the books this is the collection for you! Love this! The angle is the perfect touch! This layout is so much fun! Love it, Stephanie! OMG Your LO is FAB-U-LOUS!!!! WOW Your niece is so cute....you definitely did a super outstanding creative job and it is not to busy....you so showcased your cutie patootie in a grand and super fun way. I love it. I am a die hard scrapper since 2004 and love seeing how other scrap as it's not only fun but love the inspiration of it all and you are a very talented scrapper. I feel honored that I got to see you awesome LO. YOU ROCK!! What a great layout Stephanie! Love the way you used all of the patterns! Oh goodness - this layout makes me feel so very Patriotic - so well done!! Love the stripes effect and the way that you have used the gorgeous Doodlebug Pattern papers to make such a cool page!! Your Title square looks so awesome - love the mini pinwheel and the cool details you added there!! !